We haven't done much to this room since Ben moved out but here are a few bits and pieces that have come together today. You'll recognize the recliner, artwork, and the quilt; the table was my grandmother's and is new to the room. I sewed the pillow covers this afternoon. Ben is insanely jealous of the octopus, which is actually a tea towel that I couldn't bear to sacrifice to the wilds of my kitchen. The crib is up - now we just need to settle on a dresser. Moving closer! We certainly don't hear much about your pregnancy with Baby J #2! Is it similar to your pregnancy with Ben? Does she move any more or less? Did you get your old baby clothes to fill the drawers? Are you having your daily dose of ice cream to 'help' things along? 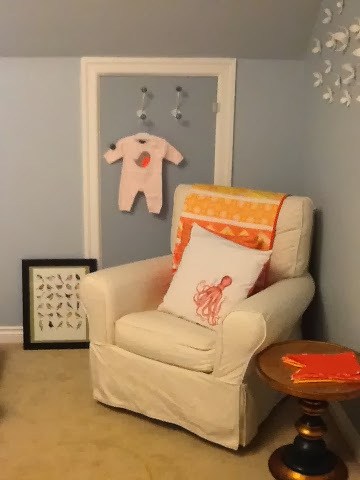 The nursery seems very cozy. Nice work! They are completely different so far! And I won’t lie: this one has been tough. I was sicker during the first three months, for one thing and I am always, always tired. They may have something to do with running after an active three year old, however! I haven’t had the leg cramps or the heartburn, so that’s a plus, but the lower back pain is *back* with a vengeance. It’s always something, right? This little gal is very active, particularly at 3 am. It’ll be interesting to see how that translates into her babyhood. We just got the dresser set up today, pulled out the clothes, and sorted the diapers so we are kind of ready to go, in the event that she arrives early. Hard to imagine that Ben once fit into those tiny little onsies.